Jennifer Langridge studied at the Royal Northern College of Music (RNCM) where she was awarded the Barbirolli Prize for Cello. She went on to become a Junior Fellow of the RNCM as part of the Nossek String Quartet, which enjoyed a successful recital career for 10 years until 1999. 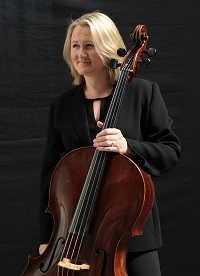 Jennifer has been Principal Cello of Psappha Ensemble for 24 years. The group performs regularly on BBC Radio 3, has made many CD recordings and released more than 160 films of live concerts on their YouTube channel. Jennifer often performs as a soloist with Psappha, most notably at the Royal Albert Hall for the BBC Proms in 2004, playing Maxwell Davies’ Linguae Ignis for solo cello and ensemble. Most recently, Jennifer has joined the newly formed Victoria String Quartet with colleagues from RNCM staff. As well as being a solo recitalist, Jennifer is also a frequent guest Principal for orchestras. Previously, she held the position of Principal Cello of the Northern Chamber Orchestra and was for ten years a member of the BBC Philharmonic. Jennifer is a highly experienced and dedicated teacher; alongside her teaching at Chetham’s School of Music, Jennifer is a cello tutor at the Royal Northern College of Music, the Junior RNCM and The University of Manchester.